Founded 1919. The monk Saint Landelin founded the abbey de Crespin. 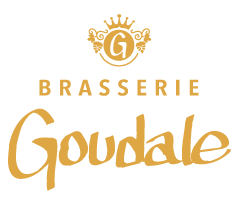 Also called La Brasserie Goudale. The name is from a former monastery, now a ruin. The name are used by Lidl. Abbaye de Vauclair Imperial. 2019. Biere Blonde. Brassée à L'ancienne. 75 cl, 4,5% ABV. 12 Plato. Saint Landelin Bière de Pâques is brewed for Easter. 75 cl, abbey style. 6,5%. Saint Landelin is the only abbey beer in France. Brewed with malt, wheat, rice, hops and spices. la Goudale Grand Cru. 2018. 33 cl, 7,9 % ABV. The strongest blond beer in the world. 25 cl. 12,0%. 21,7% Plato. 75 cl, 7,2 % ABV. Tom fermentet. With coriander and orange peel. la Goudale de Noël. 2016. 75 cl, abbey style. 6,8%.